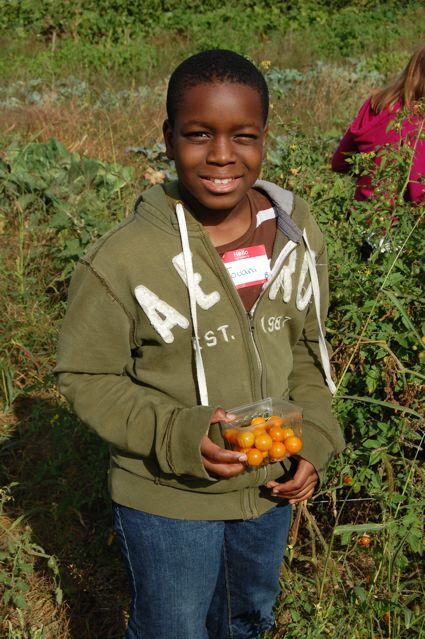 The Kenwood 5th graders visited Peterson Produce in Orono on a beautiful fall day during their 2nd week of school. 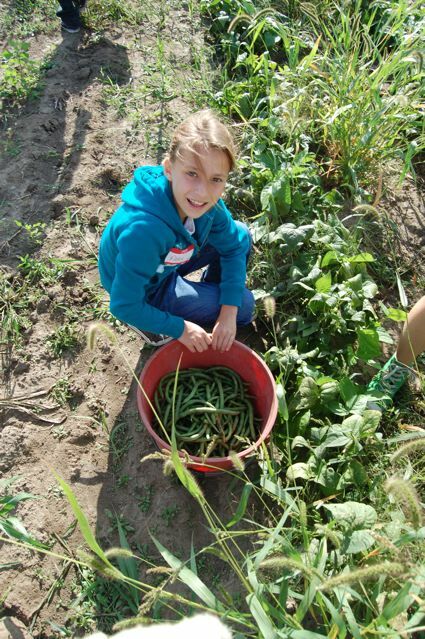 As a part of our Fall series of lessons called “Grown Near Home,” kids learn many good reasons why growing, buying and eating foods grown here in Minnesota is best for our environment, our health and our farmers. We left early just as the school day was beginning and arrived on the farm ready for work. When the kids visit Peterson Produce they know they are there to help and to really learn about the jobs a farmer must do during the harvest season. This is a real working farm and we are respectful of the importance of the farmer’s daily routine. Farmer’s Jean and Al were our hosts for the day. Jean set up 4 work stations so the kids would get a chance to “taste” and experience a variety of jobs on the “to do” list for the day. Working in pairs, the kids at one station set about picking as many green and yellow beans as they could in 15 min. 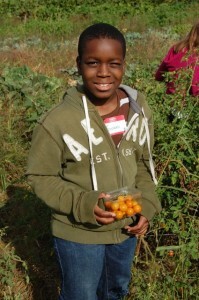 At another station the kids ate, I mean picked, delicious little orange cherry tomatoes and put them in little baskets. In the barn Al had the kids bunching garlic bulbs that were drying in bundles hanging on the barn wall. Meanwhile, the greenhouse was busy with kids as they pulled back the leaves on the ornamental corn, found wonderful colors inside, and tied them together for sale. It was amazing for the kids to see how they could help Farmers Jean and Al harvest and prepare their vegetables for sale at their roadside stand on Hwy 12. After every child had visited each station and we were ready for a break, Jean led the kids through the tall broom corn rows. Wow! We felt like munchkins weaving our way from one end to the other, and as we looked up, it was hard to see the sky! To celebrate our hard work, we then walked about a half mile to a small lake on the farm and ate our lunch on the shore. At the end of our adventure, Jean led us on a short hike in the woods, then back through the pumpkin patch to await the buses. It was a perfect day, and I think as some of the kids lay on the grass looking up at the sky, a few might have thought the life of a farmer is hard but pretty sweet.